Spanish Phrase of the Day: Arrrrgh! It were Halloween! 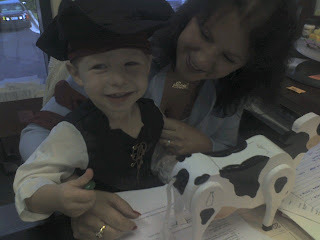 Joseph loves coming to the office. Not for me, mind you, but for Bea and her cow full of jellybeans. You pull on the vaca's tail and out pop the jellybeans. As soon as he walks in the door he goes straight there. 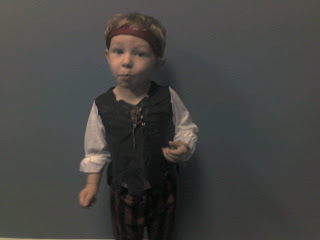 He came by yesterday, dressed as a pirate for halloween. These are from my Q. The hat doesn't stay on too long. A mouth full of jellybean. 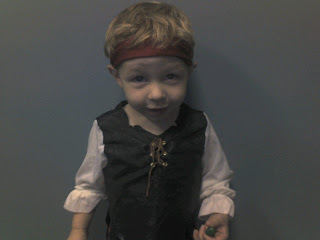 Cute little pirate!!! And I like his priorities: CANDY!! !